A new independent resource assessment suggests the Orphan Basin could hold twice the oil of the Flemish Pass. A new report suggests the Orphan Basin could hold twice as much oil as the Flemish Pass. The provincial government released a resource assessment by Beicip-Franlab on Thursday that suggests there are potentially 25.5 billion barrels of oil in the West Orphan Basin, compared to the 12.5 billion barrels the Flemish Pass is believed to hold. It's a study the provincial government hopes will attract even more investment than the Flemish Pass, which garnered $1.2 billion in bids last year. "The 2016 assessment adds to our growing knowledge about our offshore oil and gas potential – leading to more exploration work by global companies and giving us assurance that we will have a thriving oil and gas industry for many years to come," said Premier Dwight Ball. Members of Newfoundland and Labrador's oil industry said the study is good news for a business that's been facing a downturn for years. "The 25.5 billion barrels estimate is larger that the remaining estimate that Norway believes its offshore holds, which is 18 billion barrels of undiscovered resources, so this is a hugely important study at this stage in our resource development," said Raymond Collins, chair of NOIA. "The industry is very excited with this announcement and we are looking forward to some early drilling to kick-start some more exploration and bring more equipment into the region to help further develop the industry." Collins said there are some important differences between the Flemish Pass and the West Orphan Basin. "There is really no subsurface knowledge beyond the seismic data. The Flemish Pass already had discoveries in place prior to the bid round so there was definitely a known working petroleum system," he said. "It's early days in the Orphan Basin compared to the Flemish Pass, but the data to date is definitely promising." Earlier this year, Nalcor said 50 prospects have been identified in the Orphan Basin following an extensive survey program. The seismic data gathered by Nalcor has improved the odds of making a significant discovery, from one in 25 to a current estimate of one in six. "Exploration is all about risk and understanding of risk and each step of our research in this area, all steps have been consistent and favourable and that's allowed that risk reduction", said Nalcor's manager of exploration Richard Wright. "This is positive. All you can change is how much you know about it and so by finding large scale prospects like are in this area, some exceeding 500 square kilometres in size, these are positive developments." Nalcor is doing $34 million in seismic work this year for resource estimates to attract oil companies. The bid round on the Orphan Basin closes Nov. 9, 2016. At the announcement Wednesday, Premier Ball responded to questions about climate change and concerns that reliance on oil should be reduced, saying it is "absolutely" on the radar. "We recognize the fact that the world is looking at climate change. We must always look for ways to actually deal with that and we will do that we are seeing that with our hydro developments as well, we see that with our own monitoring around greenhouse gases," said Ball. "But we also know that there is a demand for fossil fuels in the world right now and there's some jurisdictions that need to be prepared for when the oil companies are ready to produce offshore." 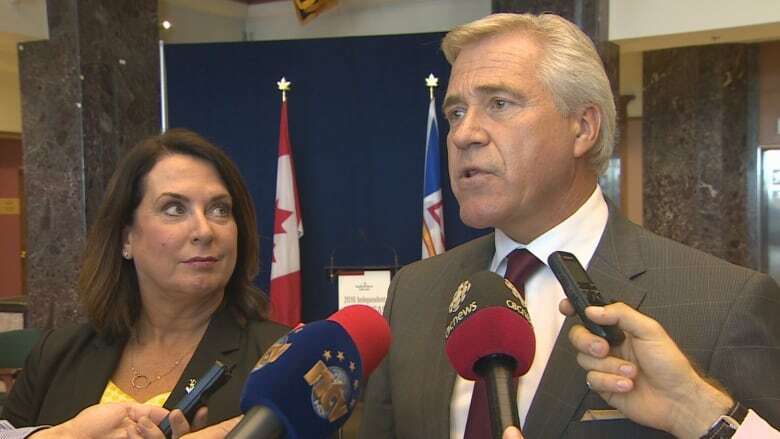 Ball said the priority right now is to get the data on the oil and complete the assessments to ensure the necessary information is available to oil companies who may want to develop in the province's offshore.